Real chocolate jimmies, at last! When I was little, the sprinkles on ice cream were called jimmies, and they were real chocolate. 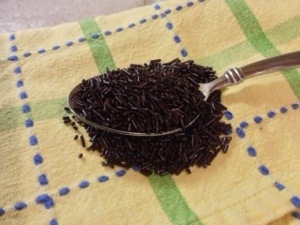 Today’s sprinkles found on the grocery shelves are made with oils and artificial flavors and colors. They are just plain gross. 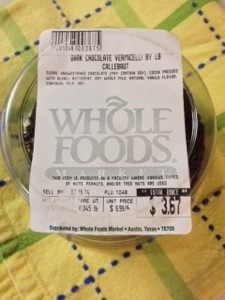 I had given up on finding chocolate jimmies and was ready to put them in my in memoriam section in the blog, but what to my wondering eyes should appear at the Whole Foods, but the real thing! These are called dark chocolate vermicelli, but believe me, these are the jimmies of my youth. Horray! Side note: Jimmies were recently accused of being a racial slur. This is untue, and it is vetted on snopes. End of story. Posted in Childhood memories, Dark Chocolate, Ice Cream. Bookmark the permalink. I’ve never known there to be an option besides the gross chemical-tasting sprinkles. They sound fabulous! Thanks for the heads-up. That’s wonderful! I wasn’t willing to put that laundry list of chemical ingredients on our stuff just for a few sprinkles. I’ll have to go check these out! Yipeee! I remember Jimmies! I used to sneak the bottle out of our pantry and just sit and eat them until my Mom would catch me… 😉 Email me please! Yay Lynn, I used to eat them plain, too!